After I lost my previous digital camera, the Casio Exilim EX-Z3 (it was stolen at Roxy), I turned my attention to my wife’s Olympus C-4000. In my opinion, this camera is nicer than the lost one. It is a bit bigger, but it is also more comfortable to hold. The picture quality is a lot better and the flash is much stronger. However, it uses Smartmedia memory cards which I found very fragile. With my old camera, I used to transfer pictures to my computer by removing its Secure Digital and placing it inside my card reader. With Smartmedia, I found out that reading a Smartmedia card with a card reader often rendered it unreadable by the camera, while still readable by computer. After wasting two Smartmedias, I found out that I’m not alone with this problem, there are lots of people having similar problem. 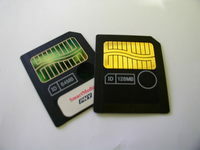 The problem is caused by several card reader’s chipset that overwrites the card’s Card Information Structure (CIS) content. The solution is to low level format the card so that the CIS gets overwritten or rewrite the CIS itself. The problem is I couldn’t find a card reader that could low level format a Smartmedia card. Those which can do a low level format are usually standalone Smartmedia reader. They are rare in todays market since Smartmedia has been deprecated and the market is full of x-in-1 readers. Inconsistent filesystem. Probably caused by negligence to unmount the media before ejecting it. Solution: use a disk checking program (use scandisk or chkdsk under Windows or fsck.vfat under Linux), format it (using format.exe under Windows or mkfs.msdos under Linux), or wipe the disk with zeroes (using dd if=/dev/zero of=/dev/camera under Linux, or use something like WinHex under Windows) and then format using the camera itself. Broken CIS. Caused by reading using some card readers. Follow this delicate instruction, assuming you have a compatible reader. You could try uncheck read-only bit on every file and directory inside the Smartmedia. This easily fixed it for some people. Lucky bastards. Try several utilities listed here. Buy another one, but follow my recommendation below. Do not read the card using a card reader, always use data cable to transfer pictures to the computer. Using a card reader may corrupt the card’s CIS information. Do not transfer files INTO the card. The camera itself might be confused by valid but complex state of filesystem such as fragmentations or missing links. Since Smartmedia is an obsolete format, we can expect the camera itself is an older model which could use simplified algorithm to access the filesystem. Do not share the card with another device such as MP3 players, voice recorders or printers. These devices could use simplified algorithm too, and might have different ideas on how filesystem should be laid out and therefore could confuse each other. Hmm, dari yang gua baca2 sih problem CF ada, tapi gak separah SM, soalnya controller CF ada di card-nya, bukan di camera (pin out CF itu sama dengan ATA, cuma beda bentuknya aja). Jadi kalau kita pakai SM , gamblangnya supaya awet gimana ?